Springtime agroecological projects with seeds, seedlings, tree saplings, farm animals, the elements, building, cooking & farm snacks, nature exploration, Native American skills, games, music and arts. Come for a day, or come for the whole extended week. Cost: $65 per full day (9am-3pm), or $295/week Mon-Fri, or $395/extended week Mon 4/15-Tue 4/23 weekdays. Youngsters 2-4: Wednesday, April 17, 10-11:30am. a morning of hands-on discovery on the farm for children accompanied by parent/guardian. Chickens & eggs, seeds & seedlings, music and movement. $20. Summer on the Farm! Camp allows children to experience the farm and surrounding creek and woodlands through active, creative, and fun activities. The program nurtures an understanding of and deep reverence for our land and the food that it provides, and incorporates the arts to allow us to imagine how the plants, animals, and elements of the farm and wilderness shape and strengthen us, even giving us superpowers! Staff and participants work and learn together, as an extended farm family does, to accomplish basic daily farm tasks such as feeding the sheep, collecting the chickens' eggs, planting and harvesting herbs and vegetables and flowers, building structures, and cooking and eating together. Surrounding these activities, we explore and celebrate the wondrous nature around us, learn some of the sustainable ways of the area's earlier inhabitants, and process these experiences through games and the arts to transform ourselves into superheroes with special powers drawn from the land. 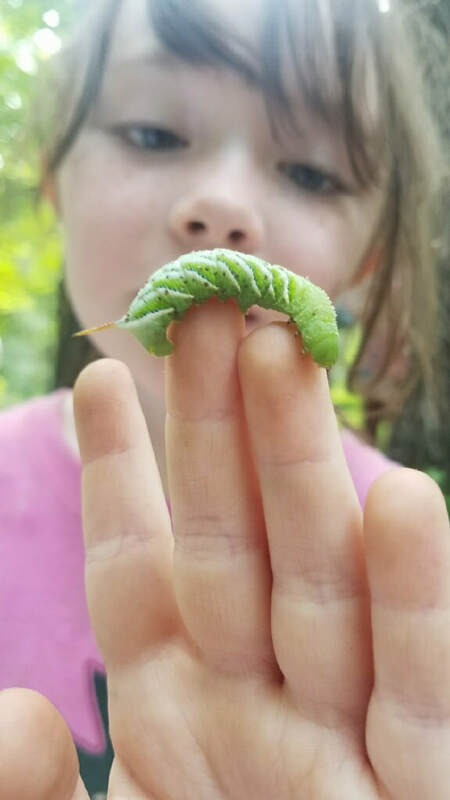 "...weaving information, history, insight, hands on activity, and song truly engaged our children which will inevitably spark future stewards of the land. We look forward to many more collaborative experiences with Seed Song Farm!" ​"Joey my 11-year old grandson absolutely loves Seed Song Farm!!! All the way home after an afternoon spent singing, exploring, planting, and learning about and collecting and cooking maple syrup, he just kept saying can we go back, I had so much fun and everyone is so nice there! Thanks, Seed Song Farm!" ​Please register for our programs early, as the size of the program will be limited. ​Please note that prior to attending one-week camps, parents will need to submit the immunization records and other medical/dietary/behavior treatment plans requested on the camp registration form, prior to the child(ren)'s first day of camp. Cost: We have received funding to make our camp programs available to all income levels, please don't let cost prevent your child from attending-- contact us. Unassisted Cost $325 per week, $275 each additional child. Times: 9am-3pm, Before & After care available from 8am-5pm or longer by arrangement. Half Day 9am-12 for 5-6 yr olds available. ​What to Bring: Brown bag lunch and two snacks, sunscreen and/or long sleeved clothing, a hat with a brim, shoes and clothes that can get wet or dirty, bathing suit, towel, and a water bottle. ​First Time visitor? Parent/Guardian please stay until child feels secure and be available for lunchtime pickup on the first day if needed. Ages 13 and older: inquire about special opportunities for teens and adults. A short tour of the farm for youth and their parent(s)/guardian(s) including some sample activities, as a glimpse of what Summer on the Farm! camp is like. Thursday & Friday June 27-28, 9am-3pm. 2 Days of farm, nature, arts, and fun activities as a full preview of what Summer on the Farm! camp holds. Unassisted Cost: $65 per day. Please click on the Registration Form link above or below to register. Explore each of the four elements – earth, fire, wind, and water – and their special powers. Build a model boat, make a windmill, cook and dry with the sun, build an earth stove. Taste vegetables grown with earth, water and sun, feed your body and imagination with their powers. Build a fire in our brick oven to make your own pizza at our 4th of July Fire wind water Works celebration. Explore the primal primate inside you during this week of monkeying in, around, with, and for trees. Special guest from 'One Little Tree' will lead art activities..
Care for the animals of the farm and forest and learn about them. Choose a mammal, reptile, amphibian, insect, bird, fish, or microorganism animal spirit guide, and explore how its gifts may change you. Make an animal mask, listen to animal stories from the many past and present cultural traditions of Kingston. Create a song, dance, costume, or sculpture. At Friday's Council of All Beings, share with the group your animal spirit and the work that it inspired. Make home-grown music, songs, and musical instruments. Ends with a performance, then the Hudson Valley Brassroots Festival July 27-28. Learn about and taste how the wild and cultivated plants at Seed Song Farm can give you super powers including strong muscles, day and night vision, and fast healing. Walk in the woods to find secret wild plants. Use seeds, leaves, and petals to create works of art. Seed, plant, care for, harvest, and eat the vegetables, herbs, flowers, and berries that give us super powers. ​Travel back in time and explore the lifeways and wisdom of the Lenape people of the 1500's that lived on and farmed this land along Esopus Creek. Work in the wicwam, play traditional games, meet around the fire pit, and cultivate the field of corn, beans, squash, and other heritage crops with members of Neetopk Keetopk (educational Native American and Allies group). Explore the woods and creek, find signs of wildlife. Make tools and art from natural materials, sing songs, and tell stories. A whole week of plants, pollinating insects, preparing farm snacks, and exploring the work and play of a Seed Song Sustainable Farmer. Learn permacultural techniques, help staff a farmstand and prepare for CSA distribution, sing songs of food and farming, play in the dirt, and participate in the all aspects of bringing food from seed and soil to table and market. Week 8: August 19 through August 23- Best of Seed Song Summer Camp! A week full of the most popular activities from the previous camp weeks. Campers will help decide-- will it be the waterslide? harvesting berries for the solar oven fruitcake? studying insects? Art with special guests? making flower bouquets? The chicken and fox game? playing a song with the band? Whichever we choose, its a guaranteed week of fun! Travel back in time and explore the lifeways and wisdom of the Lenape people of the 1500's that lived on and farmed this land along Esopus Creek. Work in the wicwam, play traditional games, meet around the fire pit, and cultivate the field of corn, beans, squash, and other heritage crops with members of Neetopk Keetopk (educational Native American and allies group). Explore the woods and creek, find signs of wildlife. Make tools and art from natural materials, sing songs, and tell stories. As a short part of each program, older children will share their work of the week with the younger children. Songs, a themed activity, picking and/or tasting farm products, and sometimes a short haywagon ride round out the visits. Dates: Wednesdays from July 3 to August 28, at 10-11:30am. Click on the link below to register. Watch for additional dates. ​Cost: We have received funding to make our camp programs available to all income levels, please don't let cost prevent your child from attending-- contact us. Unassisted Cost $20 per child, each additional child $15. We received our official summer camp permit from the Ulster County Dept of Health! We have on-site staff trained and certified by the Red Cross in first aid, CPR, AED, and Waterfront Safety. What is the age range of the camp staff? Currently 2 x 50's, 1 x 40's, 2 x 30's, 2 x 20's, teen Counsellors-in-Training (CIT's) & helpers. What is the ratio of staff:campers? It ranges between 1:6 and 1:12, with a minimum of 2 staff on hand. How do you prepare for medical emergencies and health issues? Our staff is trained and certified in First Aid by the Red Cross. The training teaches when it is appropriate to call 911. One of Seed Song Center's board members is highly active with, and travels widely as a volunteer for, Red Cross and has put together our emergency plan. Another board member is a Registered Nurse and serves as our Medical Director. Are lunch/snacks provided, or should we send the child with lunch and snacks? There will be fresh farm snacks but lunch and 2 snacks need to be provided (see registration info on website). Please pack lunches that do not need to be refrigerated. Questions? ​Please contact us at info@seedsongfarm.org or leave a message at 845-383-1528 and we'll call you back.